1Universidade Federal Rural de Pernambuco, Rua Dom Manuel de Medeiros, S/N, Dois Irmáos, CEP 52171-900, Recife, Pernambuco, Brasil. 2Universidade Estadual da Paraíba, Rua Baraúnas, 351-Universitário, CEP 58429-500, Campina Grande, Paraíba, Brasil. 3Embrapa Algodao, Rua Osvaldo Cruz, 1143, Centenário, CEP 58428-095, Campina Grande, Paraíba, Brasil. Ramulosis (Colletotrichum gossypii South var. cephalosporioides Costa) is a fungal disease of cotton (Gossypium hirsutum L.) that causes damage to leaves, stems, and bolls by reducing fiber production; it can be controlled by chemical fungicides. Geraniol is a monoterpenoid produced by some aromatic plant species whose fungicidal properties have been widely reported. Geraniol synthase (GES; EC 3.1.7.11) is the precursor enzyme involved in the biosynthetic chain of geraniol. Geraniol synthase (ges) gene transcripts were prospected in 11 aromatic species with molecular and phytopathological tools to identify promising accessions for further use in in vitro and in vivo assays involving the control of cotton ramulosis. Menthapulegium L. oil highly expressed ges and inhibited fungal growth at 1000 (L L-1 in an in vitro assay. Validation assays were carried out in two environments and M. pulegium at 2000 (L L-1 reduced the initial and final severity indices of the disease to 48% and 52%, respectively, in preventive treatments; in curative assays, indices were 44% and 54%, respectively. This indicates that it is a promising bioactive compound to control cotton ramulosis. Increased crop yield associated with low management costs have been a major challenge for agricultural competitiveness in any country of the world. Chemical pesticides represent high crop management costs in addition to some negative effects to the environment. Brazil is a large producer of fibrous and oleaginous crops and great consumer of pesticides for crop protection (Pignati et al., 2014). Herbicide costs represent approximately 45% of total commercial pesticides, while fungicides and insecticides contribute 14% and 12%, respectively (Anvisa, 2014). The use of plant bioactive compounds represents an alternative pest control method because it minimizes these costs: their efficiency and viability have been reported in several studies in the literature (Melo et al., 2013; Singh et al., 2014; Guerra et al., 2015). Aromatic species offer extensive benefits for crop pest control due to biopesticide activity, mainly by essential oils (Hussain et al., 2008; Lima et al., 2008). These oils mainly consist of terpenes and terpenoids (geraniol, sabinene, thymol, carvacrol, and eugenol among others), which are volatile molecules with low molecular weight that are structurally different. They accumulate in all organs and exhibit several functions depending on the oil's main bioactive compounds, including germination inhibitors, fungicides, pollinator-attracting compounds, and insecticides (Lima et al., 2008; Melo et al., 2013; O'Bryan et al., 2015). Geraniol is a cyclic monoterpenoid alcohol present in several aromatic species, mainly in flowers (Guerra et al., 2015). The products of geraniol oxidation, geranial and neral, produce citral, which is a citrus odor compound abundant in several genera such as Cymbopogon, Zingiber, Ocimum, Mentha, Origanum, and Rosmarinus (Hussain et al., 2008; Karray-Bouraoui et al., 2009; Guerra et al., 2015). Geraniol oil has been reported to be effective against plant pathogens, and it has potent fungicidal and bactericidal activity (Guerra et al., 2015). The geraniol precursor enzyme is encoded by geraniol synthase (ges), a gene with an open reading frame (ORF) ranging from 1.7 to 2.0 kb. The National Center for Biotechnology Information (NCBI) gene bank provides the ges sequences of Cinnamomum tenuipilum (Yang et al., 2005), Olea europaea (Vezzaro et al., 2012), Catharanthus roseus (Simkin et al., 2013), Perilla setoyensis (Masumoto et al., 2010), Ocimum basilicum (Iijima et al., 2004), Phyla dulcis (Yang et al., 2011), and Vitis vinifera (Martin et al., 2010). The alignment of these sequences shows several homologous regions, which can be used as specific probes or tags to assist in molecular studies related to crop protection. Cotton (Gossypium hirsutum L.) is an important commodity in the world economy. The crop is grown in several countries and provides natural fibers to the textile industry. Brazil is a large cotton producer with over 1.4 million tons on 957 000 ha (Conab, 2016). The high cost to protect crops against pests is the limiting factor in cotton management, especially fungal diseases that occur in the entire Brazilian cotton belt. Ramulosis (Colletotrichum gossypii South var. cephalosporioides Coast) is a serious fungal disease in cotton fields that causes certain damage and depends on the infestation level (Suassuna and Coutinho, 2015). Strong shedding takes place when the disease is established before blooming, and this affects plant growth and boll production (Melo et al., 2013). The disease is controlled by massive applications of chemical fungicides. The literature provides some research results showing the control of Colletotrichum by essential oils, although most of them are limited to in vitro assays. Rozwalka et al. (2008) reported antifungal activity with lemongrass oil (Cymbopogon citratus [DC.] Stapf) against Glomerella cingulata and Colletotrichum gloeosporioides on fruit guava. Sousa Júnior et al. (2009) tested several essential oils against C. gloeosporioides on passion fruit (Passiflora edulis Sims) and found total inhibition with Ocimum gratissimum L., Lippia sidoides Cham., L. citrodora Kunth, and C. citratus oils at 1 llL mL4 in in vitro assays. Using C. gossypii var. cephalosporioides, Lima et al. (2008) showed that citronella (Cymbopogon nardus) oil inhibited mycelial growth by approximately 94% and subsequent reduction of disease progression in a preventive assay carried out in a greenhouse. Santos et al. (2011) used Rosmarinus ojficinalis and Baccharis trimera oils at 1% in preventive assays and found ramulosis in cotton plants decreased to approximately 69% and 55%, respectively. Despite the large contribution of findings available in the literature regarding pest control via plant bioactive compounds, there is limited information as to the effectiveness of control under natural conditions. This information is essential to validate the bioprocess and make further recommendations to growers. In the present study, we evaluated the effectiveness of geraniol to control cotton ramulosis, focusing on the selection of plants with high ges expression and subsequent validation of fungitoxicity through phytopathological and agronomic assays. Seeds of 11 aromatic species were commercially acquired and used for bioassays. These were Cymbopogon nardus (L.) Rendle, Jasminum ojjicinale L., Mentha pulegium L., M. viridis (L.) L., Ocimum basilicum L., O. gratissimum L., Origanum majorana L., Peumus boldus Molina, Plectranthus amboinicus (Lour.) Spreng., Rosmarinus ojficinalis L., and Ruta graveolens L.
Sowing was carried out in a greenhouse using 2-L pots containing previously fertilized soil (NPK, 10:10:10, v/v, ammonium sulfate, simple superphosphate, and potassium chloride) and watered daily. After 30 d of emergence, young leaves (1 g) from each accession were collected for RNA extraction (Invisorb Spin Plant Mini Kit, Stratec Molecular, Berlin, Germany) according to the manufacturer's recommendations. The cDNA of each accession was synthesized (ImProm-II Reverse Transcription System kit, Promega Corporation, Madison, Wisconsin, USA) according to the manufacturer's recommendations. Reverse transcription was performed in 44 (L as follows: 11 (L cDNA reaction containing 1 (g total RNA, 0.5 (g Oligo dT15 (10 mM), 1X ImProm-II Reaction Buffer, 6 (L MgCl2 (25 mM), 0.5 (L dNTP set (10 mM), 1 U (L-1 Recombinant RNase Ribonuclease Inhibitor, and 1.25 U (L-1 ImProm-II RT. Samples were incubated in a thermal cycler at 25 °C for 5 min and then at 42 °C for 1 h and 70 °C for 15 min. For semiquantitative assays, reactions were performed in a 25 (L final volume containing 2 (L cDNA (1 (g), 0.04 U Taq DNA Polymerase (Fermentas), 0.2 mM dNTP set (10 mM), 1.5 (L MgCl2 (25 mM), 1X kit buffer (10X), and 0.8 (lL each of forward (5' AGGTTGGAAGCGAGACGATTC 3') and reverse (5' GTTCCBAGATCATCCCRRAG 3') ges primers (10 mM). This primer combination amplifies a 0.52 kb ges fragment. The RT-PCR thermal condition was pre-denaturation at 95 °C for 7 min, followed by 35 denaturation cycles at 94 °C for 1 min, annealing at 56 °C for 1 min, and extension at 72 °C for 1 min. A final extension was added at 94 °C for 5 min. The fi-actin gene was selected as a reference control, which is represented by a 0.50 kb fragment (forward, 5' GATRTTGTCATATCTGCACTTGCA 3' and reverse, 5' GGCTCTTCTGATCATCCTCTTC 3' primers). Amplicons were analyzed in agarose gel (0.8%) and photo-documented (MiniBIS Pro, Bio-Imaging Systems, Neve Yamin, Israel). The gel was then used for PCR blotting using a non-radioactive probe to validate the products generated by the reaction (Soares et al., 2018). Amplicons were transferred to a nylon membrane (Hybond-N +, Amersham Pharmacia, St. Albans, UK) by capillarity. A probe (0.52 kb) was generated with forward (5' AGGTTGGAAGCGAGACGATTC 3') and reverse (5' GTTCCBAGATCATCCCRRAG 3') ges primers (10 mM) and labeled with AlkPhos Direct and Labeling and Detection Systems kit (Amersham Pharmacia) according to the manufacturer's recommendation. The relative expression of ges was estimated by qRT-PCR (Eco Real-Time PCR System, Illumina, San Diego, California, USA) according to the manufacturer's instructions. Reactions were performed in a 10 (L final reaction containing 5 (L Evagreen (Biotium, Fremont, California, USA), 0.8 (L forward (5' GGTGGTGGAAGGATGCTCGGTTTGG 3') and reverse (5' CCATARGTATCKAAAMTATCATC 3') ges primers (10 mM), and 2 (L cDNA (1:10, v/v). Two-step RT-PCR procedures were performed in all the experiments; first at 95 °C for 15 min and then 40 cycles at 95 °C for 20 s, 60 °C for 20 s, and 72 °C for 20 s. A denaturation curve (melting curve) was obtained after concluding amplification at 95 °C for 15 s and 60 °C for 15 s, increasing by 2 °C min-1 until reaching 95 °C. The combination of forward (5' TTGCAGACCGTATGAGCAAG 3') and reverse (5' ATCCTCCGATCCAGACACTG 3') fi-actin primers (10 mM) were used as a reference control. Both ges and (-actin primers amplify a 172 bp fragment. The graphics, Cqs, and melting curve were automatically generated by the Eco Real-Time PCR System thermocycler (Illumina) software based on the normalization method with three reference genes (Livak and Schmittgen, 2001). The expression pattern was estimated by relative quantification. The primers used in the present study were previously designed from conserved regions of the ges gene available in the NCBI gene bank. The ClustalW2 program (www.ebi.ac.uk) was used to align the accessions (AJ457070.2) Cinnamomum tenuipilum (Yang et al., 2005), (JN408072.1) Olea europaea (Vezzaro et al., 2012), (FJ644545.1) Perilla setoyensis and (FJ644547.1) Perilla jrutescens var. hirtella (Masumoto et al., 2010), (AY362553.1) O. basilicum (Iijima et al., 2004), (GU136162.1) Phyla dulcis (Yang et al., 2011), and (HM807399.1) Vitis vinijera (Martin et al., 2010). A pathogenicity assay was previously carried out to identify the most pathogenic isolates of Cgc collected from the cotton belt in the Cerrado (Savannas) region, Mato Grosso, Brazil. Five isolates were used from Pedra Preta, Primavera do Leste, Campo Verde, and Novo Sáo Joaquim. Each isolate was cultured in potato dextrose agar (PDA) at 25 °C and 12:12 h photoperiod for 15 d. Conidial suspensions at 1 × 106 mL-1 were previously prepared for further inoculation of cotton plants. Seeds (cv. BRS 8H) were sown in pots (1 L) containing organic substrate in a greenhouse. Two plants were maintained in each pot. At 28 d after emergence, leaves located at mid-canopy were superficially wounded with an abrasive solution (0.01%; Celite 545 PA, Merck KGaA, Darmstadt, Germany) and then sprayed with a conidial suspension of each isolate. After inoculation, plants were incubated in a humid chamber for 72 h. Each treatment (isolates) had six replicates with two plants each arranged in a completely randomized design. The disease severity index (DSI) was estimated 50 d after inoculation using a rating scale described by Lima et al. (2008): 1: plants without symptoms; 2: plants with necrosis and spots on young leaves; 3: plants with necrotic spots on leaves and stems, death of apical meristems, and shortened internodes; 4: plants with necrosis and spots on leaves and stems, shortened internodes, and excessive budding; and 5: plants showing necrotic spots on leaves, shortened internodes, excessive budding, and size reduction. Mean results of disease ratings were calculated 78 d after emergence among the isolates by the formula ID = 2 (grade scale × frequency) × 100: nr total unit × maximum degree of the scale; the degree of disease severity was used and estimated to describe the scale scores from 1 to 5. Data were submitted to ANOVA and means were compared by the Scott-Knot test at 5%. This assay was performed by using the most pathogenic isolate identified in the abovementioned assay, and bioactive compounds (essential oils and crude extracts) obtained from aromatic species. Crude extracts were prepared from leaves according to the following treatments: fresh, dried (37 °C for 48 h), and heated (infusion at 100 °C for 10 min). Each treatment was tested at 10%, 5%, and 1%. All the treatments with essential oils were tested at 2000, 1500, 1000, and 500 (L L-1 based on the methodology described by Lima et al. (2008). Oils were added separately to PDA at 50 °C and poured onto Petri dishes (9 cm diameter). A small disk (0.5 cm) of PDA + mycelia was deposited in the center of each plate. Plates were then randomized and incubated in a BOD (Biochemical Oxygen Demand) growth chamber at 28 °C and 12:12 h photoperiod. The diameter of the colonies was measured every 24 h for 7 d. All oils used in this assay had high purity levels and were purchased commercially (www.natue.com.br). This assay was performed by using the most responsive bioactive compounds identified in the above mentioned bioassays in curative and preventive treatments against Cgc. Assays were conducted under field conditions from August to October 2015 in Recife (08°03'14" S, 34°52'52" W, 4 m a.s.l. ), Pernambuco, and Campina Grande (07°13'50" S, 35°52'52" W, 551 m a.s.l. ), Paraiba. Seeds of 'BRS 8H' were grown in pots (15 L) containing previously sterilized and fertilized soil (NPK, 30:60:30, v/v) and watered daily. Two plants were maintained per pot. Temperature and relative humidity (RH) during the assays ranged from 29.6 to 31.2 °C and 59% to 55%, respectively, in Recife (Apac, 2015), and 22.6 to 26.5 °C and 57% to 55%, respectively, in Campina Grande (INMET, 2015). Bioactive compounds were assayed in two treatments, that is, a curative treatment (CT) in which plants with ramulosis were further treated with bioactive compounds, and a preventive treatment (TP) in which plants previously treated with bioactive compounds were infected with Cgc after 24 h. Treatments were applied at 25 d after emergence. Plants were sprayed with a conidial suspension (1 × 106). They were then incubated in a humid chamber for 72 h. In the CT, a positive control was added, that is, the commercial fungicide thiophanate-methyl (dimethyl 4,4'-(o-phenylene)bis(3-thioallophanate); Cercobin 500, Ihara, Sorocaba, Sáo Paulo, Brazil) at 1 mL 100 L-1 water. Plants were sprayed when the first symptoms appeared 72 h after inoculation. The initial (ISI) and final severity (FSI) indices of disease were evaluated from 3 to 50 d after inoculation, respectively, by the formula described by Lima et al. (2008): ID = ( (degree of disease scale × frequency) × 100/total number of unit × maximum degree of disease scale. The degrees of disease severity were estimated by a descriptive point scale ranging from 1 to 5. All assays were performed using a completely randomized design and six replicates. Data were subjected to ANOVA using Sisvar v.5.3. (Universidade Federal de Lavras, Departamento de Estatística, Lavras, Minas Gerais, Brazil). The Skott-Knott test (p < 0.05) was used to compare means. Eleven aromatic species (containing geraniol) were used in the present study to evaluate their effectiveness to control cotton ramulosis by focusing on molecular, phytopathological, and agronomic assays. Results showed different responses to ges expression in aromatic species and the effectiveness of essential oils to control ramulosis under natural conditions, as described below. A 500 bp fragment, previously designated from geraniol synthase (ges), was used to evaluate the semiquantitative and relative expressions of the gene. The most aromatic species showed a putative ges amplicon (0.50 kb), which was further confirmed by RT-PCR blotting. Only M. viridis did not exhibit amplification (Figures 1A,B). The relative expression of ges transcripts was estimated by qRT-PCR using ß-actin as a reference gene. We verified several levels of expression, highlighted by M. pulegium, O. majorana, O. basilicum, and R. ojjicinalis with peaks of 100X, 25X, 20X, and 17X, respectively (Figure 2). Based on these results, these four species were selected for further in vivo and in vitro assays. Figure 1 A: Amplicons generated by semiquantitative reverse transcription polymerase chain reaction (RT-PCR) by using ges primers; B: Blottings of ges generated by probe (0.50 kb) labeled with alkaline phosphatase; C: Amplicons generated by fi-actin primers (0.52 kb) used as a reference control; M: Marker Ladder 100 bp (Ludwig); 1: Rosmarinus officinalis; 2: Ocimum gratissimum; 3: Ruta graveolens; 4: Peumus boldus; 5: Cymbopogon nardus; 6: Plectranthus amboinicus; 7: Jasminum officinale; 8: Origanum majorana; 9: Mentha spicata; 10: M. pulegium; 11: Ocimum basilicum. Figure 2 Relative expression of ges. Chart generated by the Eco Real-Time PCR System program (Illumina) from data ACq and melting curve based on the regulation of ß-actin. Five isolates of Cgc were evaluated for pathogenicity based on in vitro assays with cotton plants carried out in a greenhouse. A disease severity index (DSI) was estimated based on symptoms verified 50 d after inoculation. We found DSI levels ranging from 41% (CCMF-CNPA061) to 76% (CCMF-CNPA058), as shown in Table 1. The latter was more pathogenic and was therefore selected for further assays. Based on ges expression results obtained with molecular tools, four aromatic species were selected for phytotoxicity assays against CCMF-CNPA058-Cgc using leaf extracts and essential oils in PDA. Three concentrations of leaf extracts were tested. We found significant differences in all treatments (fresh, dried, and heated) and concentrations; however, the inhibition growth rate of CCMF-CNPA058-Cgc was quite limited, less than 50% (Figure 3). Hence, we suggested that a possible selection of leaf extracts from M. pulegium, O. majorana, O. basilicum, or R. officinalis to control cotton ramulosis may not be viable based on the concentrations used in the present study. We found wide differences in treatments for bioassays carried out with essential oils at low concentrations and with mycelial growth inhibition of CCMF-CNPA058-Cgc at 500 (L L-1 and full inhibition at 1500 (L L-1 (Figure 4). These are promising results because they indicate that ramulosis can be biologically controlled. 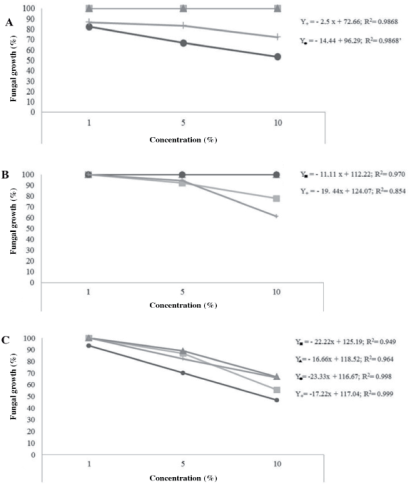 The oil from M. pulegium was more effective, reducing the growth of CCMF-CNPA058-Cgc by more than 80% at 1000 (L L-1, thus confirming high expressivity (Figure 2). 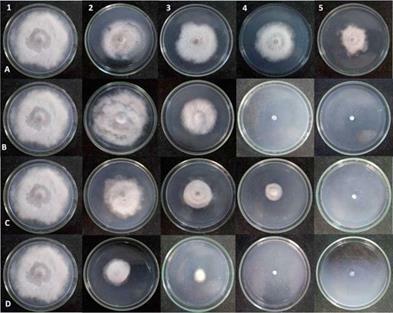 Details of mycelial growth in all treatments are found in Figure 5. The figure shows that the fungus was completely inhibited in the presence of M. pulegium and O. majorana at 1500 (L L-1. To confirm the results obtained with aromatic species for growth inhibition of CCMF-CNPA058-Cgc in in vitro assays (Figure 5), a trial was performed in two environments to validate the effectiveness of M. pulegium, O. majorana, and O. basilicum oils under natural conditions. The control of cotton ramulosis was evaluated in preventive and curative treatments using a mycelial suspension (1 × 106). The safety margin to ensure the effectiveness of the control under natural conditions was taken into account and all oils were tested at 2000 (L L-1. Symptoms of the fungus were seen rapidly, 72 h after inoculation, and characterized by circular spots on young leaves and further development of star-shaped perforations in the leaf blades. At 50 d after inoculation, the fungus induced abnormal bud sprouting, which resulted in branch clusters. The initial (ISI) and final severity (FSI) indices of disease in cotton plants grown in two environments are shown in Table 2. Significant differences were found in traits in both treatments for all essential oils. In the preventive treatment, we found that plants protected by M. pulegium oil showed low ISI in Campina Grande and Recife; these were the same as the values obtained with the fungicide. The mean of FSI in both environments, estimated at 50 d after inoculation, was 35.83% and lower than the fungicide (44.18%). Compared to the control (plants sprayed with water and further inoculated with conidial suspension), the oil of M. pulegium reduced ISI and FSI by 42% and 50%, respectively, in Campina Grande and 51% and 53%, respectively, in Recife. In the curative treatment, M. pulegium and O. basilicum oils maintained disease severity low on the scale in both environments. Compared to the control, the reduction in ISI and FSI, based on the mean of these two species, was 40% and 55%, respectively, in Campina Grande and 47% and 53%, respectively, in Recife respectively. These results are closer to those found in the preventive treatment. 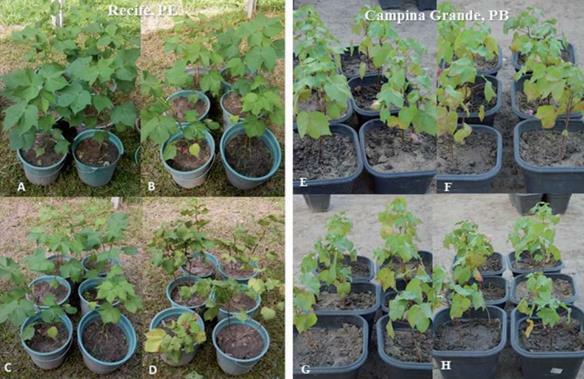 The performance of cotton plants protected with M. pulegium in preventive and curative treatments in two environments is revealed in Figure 6. In both situations, the canopy of plants treated with oil was healthier and more vigorous when compared to both the control and the fungicide treatment. Table 1 Disease severity index (DSI) in Colletotrichum gossypii var. cephalosporioides (Cgc) isolates inoculated in cotton plants. Means followed by the same letter do nonsignificantly differ according to the Scott-Knott test (p ( 0.05). Figure 3 Inhibition rate of CCMF-CNPA058-Cgc growth in potato dextrose agar (PDA) containing leaf extracts A: heated (infusion at 100 °C for 10 min); B: fresh; C: dried (37 °C for 48 h). • Ocimum basilicum; + Mentha pulegium; ■ Rosmarinus officinalis; ▲ Origanum majorana. Regression equation and R2 are shown for each sample. Coefficient of variation (CV%) and F values for treatments A: 1.40 and 117.77; B: 0.88 and 857.70; C: 1.52 and 181.36, respectively. Crop pests are the main obstacles to productivity and agricultural growth. Despite the various strategies currently available to combat them, synthetic pesticides are the most used and these increase production costs and environmental damage. Society is demanding that technologies be developed which are less aggressive to man and are more agroecological; this has stimulated studies related to protecting plants with plant bioactive compounds. In countries with extensive biodiversity, such as Brazil, investment in research in this segment generally provides promising results. 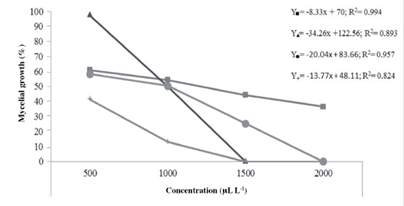 Figure 4 Inhibition rate of CCMF-CNPA058-Cgc growth in potato dextrose agar (PDA) containing essential oil of aromatic species. • Ocimum basilicum L.; + Mentha pulegium; ■ Rosmarinus officinalis; ▲ Origanum majorana. Regression equation and R2 are shown for each sample. Coefficient of variation: 4.47; F value: 361.40. Figure 5 Details of CCMF-CNPA058-Cgc growth in potato dextrose agar (PDA) containing essential oil of aromatic species. A: Rosmarinus officinalis; B: Origanum majorana; C: Ocimum basilicum; D: Mentha pulegium; 1: Control; 2: 500 (L L1; 3: 1000 (L L1; 4: 1500 (L L1; 5: 2000 (L L1. Despite the large number of articles available in the literature that demonstrate the potential of some plant bioactive compounds for crop protection, some of them are limited to in vitro assays, whose results are not always confirmed when used under natural conditions. We used various tools to prove the effectiveness of aromatic species to control cotton ramulosis. First, we made a botanic query about aromatic species that putatively contain geraniol, based on the characteristic aroma exhaled in leaves. Since the level of geraniol is variable between species and a limitation to quantify this terpenoid by chromatography, the strategy to identify promising species through the expression of ges transcripts was appropriate because the gene encodes geraniol synthase, a precursor enzyme in the biosynthetic chain of geraniol (Masumoto et al., 2010; Vezzaro et al., 2012; Simkin et al., 2013). Table 2 Initial severity (IIS) and final severity (IFS) indices of disease in cotton plants inoculated with CCMF-CNPA058-Cgc in preventive and curative treatments with essential oils. Means with the same letter do nonsignificantly differ according to the Scott-Knott test (p < 0.05). Original data transformed by √ (x + 0.5) for statistical analysis. 1: Ocimum basilicum; 2: Mentha pulegium; 3: Origanum majorana; 4: Control (plants inoculated with fungus and sprayed with distilled water); 5: Fungicide (thiophanate-methyl). CG: Campina Grande; REC: Recife; CV: coefficient of variation. Preventive: plants were previously treated with essential oil or fungicide and infected with fungus after 24 h; Control in curative treatment: Plants infested with ramulosis were further treated with distilled water; Control in preventive treatment: plants previously treated with distilled water were then infected with fungus after 24 h; Curative: plants infested with ramulosis were further treated with essential oil. Figure 6 Performance of cotton plants ('BRS 8H') subjected to inoculation with CCMF-CNPA058-Cgc in preventive and curative treatments with Mentha pulegium oil in Recife (left) and Campina Grande (right). A and E: curative, B and F: preventive, C and G: fungicide, D and H: control treatments. The relative expression of M. pulegium was higher than other accessions (Figure 1). Unaware of the biochemical characteristics of the extract and essential oil of aromatic species under natural conditions, we decided to include three other accessions in additional assays (R. officinalis, O. majorana, and O. basilicum) because they also showed a reasonable expression of ges transcripts. Another strategy was to perform in vivo assays in different environments to demonstrate the effectiveness of the oils used; both locations provided favorable environmental conditions for disease development and validation of results. According to Carvalho et al. (1981), the analysis of several isolates of C. gossypii var. cephalosporioides cotton collected in the region of Goiás in Brazil has shown that the best temperature for fungal growth is 28 °C and that growth is markedly reduced below 15 °C and above 33 °C. Based on the methodologies and species implemented in the present study, no expressive effect was found with leaf extracts to control cotton ramulosis in in vitro assays (Figure 3), although some results have been found in the literature with others pathogens or crops at high concentration of extracts in in vitro assays. Celoto et al. (2011) used leaf and branch extracts from Momordica charantia at 50% and found inhibition of 71% and 65% in mycelial growth, respectively, in a solid medium; the inhibitions in the liquid medium were 86% and 81%, respectively. Venturoso et al. (2011) found that extracts of Syzygium aromaticum (L.) Merr. & L.M. Perry, Allium sativum L., and Cinnamomum zeylanicum Blume at 20% reduced the mycelial growth of several pathogens, including Colletotrichum sp. and Fusarium solani. Although these findings are interesting, the feasibility for further implementation may be limited by the great amount of raw material necessary to prepare the extract. Our results with essential oils showed that the best was M. pulegium, which inhibited fungal growth at 1000 (L L-1 in an in vitro assay (Figure 4). Furthermore, in validation tests with cotton plants infected with Cgc, M. pulegium oil at 2000 (L L-1 reduced the initial and final severity of disease indices to 48% and 52%, respectively, in the preventive treatment, while it was 44% and 54%, respectively, in the curative assays based on the means of two environments (Table 2). These results are quite expressive because they demonstrate viability to control cotton ramulosis by natural bioactive compounds. Mentha pulegium is a perennial runner plant, belonging to the Lamiaceae family; it is native to Europe and North Africa as well as Asia and the Middle East (Oliveira et al., 2011; Wang et al., 2013). The Mentha genus has several species known as mints and is widely distributed worldwide mainly in tropical and subtropical regions (Toloza et al., 2006; Wang et al., 2013). The attractive characteristic aroma is exhaled from the whole plant, especially in its aerial parts that have glandular trichomes that are responsible for biosynthesis and essential oil secretion (Rodrigues et al., 2013). Mentha pulegium oil is primarily a compound of oxygenated monoterpenes, including geraniol (Karray-Bouraoui et al., 2009; Teixeira et al., 2012). However, menthol is one of the main oil components (Darvishi et al., 2016). Considering the ease of management and wide climatic adaptability of the species, the cultivation of mint could be incorporated on farms to further implement the natural control of cotton ramulosis in agroecological management. Mentha pulegium reduced the initial and final severity indices of the disease in the preventive treatment and curative assays, indicating that it is a promising bioactive compound to control cotton ramulosis. The use of oils and extracts may prove to be an effective and sustainable alternative for the treatment of ramulosis. Furthermore, the genetic characterization of aromatic species constitutes an important source of information for using natural resources, enabling the discovery of new species possessing genes responsible for the synthesis of metabolites that serve as an alternative for environmental conservation strategies. We thank the Empresa Brasileira de Pesquisa Agropecuária (Embrapa) and Coordenação de Aperfeiçoamento de Pessoal de Nível Superior (CAPES) for financial support and scholarship funding.